Dorothy, Lana Del Ray and more at the clubs and arenas! UCF season is just beginning, going for another championship on the hardcourt. We got it covered, for a little more than 23 years now. So much to do, and only 11 months left in the year to do them! Vote for your favorite Corona Bartender in and around Otown this month! Burnsy is still waking up from this dream season, and ready to explain what happened. 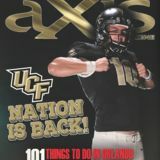 PUBLISHERS: Sean Perry • Rick Wheeler ADVERTISING INQUIRIES: rhweeler@axismag.com • 407.230.1365 EDITORIAL INQUIRIES: sperry@axismag.com COVER IMAGES: Courtesy of: UCF Sports COVER & ART DIRECTION: Evan Comtois PUBLISHED BY: Mocomm, Inc. dba aXis Magazine P.O. Box 2391 Orlando, Fl 32802 MAGAZINE: www.aXisMag.com @aXisMagazine @aXisOrlando EVENTS: www.aXisproevents.org ©1994-2018 ALL RIGHTS RESERVED Feel free to reproduce without prior written consent from Mocomm Inc, Orlando, Florida since this is the internet generation. DRAMA/ACTION Friday, Jan.12 Three Midwestern brothers, a crime lord, and an incorruptible cop are on a deadly collision course when the youngest brother’s fiancée is kidnapped by human traffickers. To save her, the MacGregor boys call on their military training - and the strength of family - to fight the most important battle of their lives. The 2nd Thursday of every month, the crowds gather for the Thornton 2nd Thursday Wine + Art Walk.Attendees come to celebrate the community, art, and partake in an evening of sights, sounds, food, shopping, and some tasty tastings all along the walk. DRAMA/MYSTERY & SUSPENSE Friday, Jan.12 Michael is an insurance salesman is on his daily commute home, when it quickly becomes anything but routine. After being contacted by a mysterious stranger, Michael is forced to uncover the identity of a hidden passenger on his train before the last stop. As he works against the clock to solve the puzzle, he realizes a deadly plan is unfolding and is unwittingly caught up in a criminal conspiracy. One that carries life and death stakes for himself and his fellow passengers. ORLANDO SCIENCE CENTER 777 E. Princeton St., Orlando Osc.org Saturday, Jan.13• 8 p.m.- 11:30 p.m. / Prices vary Get ready for one of the most spectacular adults-only Science Center events of the year. Experience Orlando’s favorite interactive technology expo in a whole new light... at night, and without the kids! ORLANDO MUSEUM OF ART	2416 N. Mills Avenue, Orlando Omart.org Saturday, Jan.13• 10 a.m. / Prices vary Explore connections between the visual and literary arts through this series of writing workshops offered in the Museum galleries.At each session, students will learn the rich histories behind works in the collection, and then respond to writing prompts that relate to the artwork. Locally-based writer Lezlie Laws will lead the writing portion of this program. IRON COW 2438 E. Robinson St., Orlando Ironcowcafe.business.site Saturday, Jan.13• 9 p.m. / Prices vary Meet us in our spiritual home (The Milk District) as we take over a brand spankin’ new venue–The Iron Cow! ORLANDO SCIENCE CENTER 777 E. Princeton St., Orlando Osc.org Friday-Monday, Jan.12-15• 10 a.m.-5 p.m. / Prices vary At Otronicon, guests walk on the cutting edge through state-of-the-art gaming and simulation technologies, including military and medical simulators not typically available to the public. 21 UCF Outdoor Adventure: Wekiva River Canoeing Trip UCF RECREATION AND WELLNESS CENTER 4000 Central Florida Blvd. Orlando Rec.ucf.edu Sunday, Jan.14• 8 a.m.-6 p.m. / Prices vary Join Outdoor Adventure on a trip to Wekiva Springs for a one day River Canoeing trip for the low cost of $15. Open to currently enrolled UCF students. UCF RECREATION AND WELLNESS CENTER 4000 Central Florida Blvd.Orlando Rec.ucf.edu Tuesday, Jan.16• 1-4 p.m. / Prices vary Are you good at sports? What about trivia? Well it’s time to put your knowledge to the test on January 16 where teams of four will compete for the coveted IM Champs shirt! ANIMATION/INTERNATIONAL Thursday, Jan.18 Mary is a plain, young girl, stuck in a rural British village with her GreatAunt Charlotte and seemingly no adventures or friends in sight. But a chance encounter with a pair of mysterious cats leads Mary into the nearby forest, where she finds an old broom stuck in the overgrowth of nearby tree, and the strange blue glow of the fly-by-night flower, a rare plant that blossoms only once every seven years. As the broom comes to life and lifts Mary high into the skies, she discovers a mysterious school for witches above the clouds. THE PLAZA LIVE	425 N. Bumby Ave., Orlando Plazaliveorlando.org Friday, Jan.19• 8 p.m. / Prices vary Come with us on an action filled journey of light and sound as we join a clique of 20- somethings who thrive to the beat of life in a city of glowing colors and heart-pounding musical tempos. DOWNTOWN ARTS DISTRICT ORLANDO 29 S. Orange Ave., Orlando Orlandoslice.com/group/cityartsfactory Thursday, Jan.18• 6-9 p.m. / Prices vary Join thousands of visitors who converge in Downtown Orlando for 3rd Thursday Orlando’s Gallery Hop and Business Networking events! ACTION & ADVENTURE/INTERNATIONAL/ COMEDY Friday, Jan. 19 Based on the best-selling action comedy manga by Hideaki Sorachi, GINTAMA takes place in an alternate Edo-period Japan, where an Alien race has taken control, forcing Samurai to lay down their swords. Once feared as the “White Demon,” former samurai Gintoki Sakata now works as an everyday handyman--until a master swordsman tasks Gintoki and his friends with finding the cursed sword Benizakura to keep it from falling into the wrong hands. ORLANDO SCIENCE CENTER 777 E. Princeton St., Orlando • Osc.org Friday, Jan.19• 5-9 p.m. / Prices vary Star-Studded Evenings are your opportunity to experience some of Orlando Science Center’s programming after dark! Learn a little more about our place in outer space through the Crosby Observatory, weather permitting. Our 10″ Byers refracting telescope is used to look at various celestial objects, depending on what is visible in the night sky during the season, as well as 8″ and 10″ reflecting telescopes. Our knowledgeable staff can even give you tips on how to stargaze at home! TEXT ‘GOLF’ to 313131 for your chance to win... A VIP EXPERIENCE TO DIAMOND RESORTS INVITATIONAL! CAMPING WORLD STADIUM Campingworldstadium.com Saturday, Jan.20-21• 7 p.m. / Prices vary Monster Jam® is adrenaline-charged family entertainment providing jaw-dropping displays and gravity-defying feats that promises to always leave fans entertained. Monster Jam events feature some of the most recognizable trucks in the world including Grave Digger®, Max-D, El Toro Loco® and many more. DR. PHILLIPS CENTER FOR THE PERFORMING ARTS 445 S. Magnolia Ave., Orlando Drphillipscenter.org Friday-Monday, Jan. 26-29• Times / Prices vary A Parody of Ice and Fire brings your most beloved and be-hated characters to life as you journey through 7 seasons of the Emmy Award winning Game of Thrones series. DRAMA/MYSTERY & SUSPENSE Friday, Jan. 26 A reckless loner sets out on a crime spree that she broadcasts on social media. After releasing a video of herself robbing a convenience store, she amasses a huge following.While traveling along the coast, she encounters a drifter, an Internet troll, and a paint huffing outsider who are all pulled into her circle of chaos, junk food, and drugs. WALL ST-SIDESHOW Orlandopubcrawls.com Saturday, Jan.20-21• 8 p.m.-1 a.m. / Prices vary We all remember the 90’s with all of the classic TV shows, movies, tunes and of course who could forget the little car chase involving O.J. Simpson. For one night only we can relive that incredible decade. The 90’s had some of the best music so we will have all of the venues on the crawl playing just your favorite hits from the 90’s. LAKE EOLA PARK 512 E. Washington ST., Orlando Orlandofarmersmarket.com Sunday, Jan 21• 8 a.m. / Prices vary The Orlando Farmers Market is much more than just your average farmers market. Find seasonal fresh produce, a wide variety of indoor and outdoor plants, artwork, and handmade craft items like jewelry, pottery, and soap. MILLS 50 DISTRICT 1312 Wilfred Drive, Orlando Sunday, Jan.28• 11 a.m. / Prices vary It’s a festival all about love! Celebrate the love of the environment, the arts, music and food! ORLANDO MUSEUM OF ART	2416 N. Mills Avenue, Orlando Omart.org Friday, Jan.26• 6:30 p.m.-8:30 p.m. / Prices vary Join us as we celebrate the opening of our spring exhibition “State of Excellence:Treasures from Florida Private Collections.” “State of Excellence” presents more than 100 works of art from outstanding private collections throughout the state of Florida. Focusing on American and European art, the exhibition will include paintings, drawings, sculpture, photography and significant decorative works from the 16th century through the mid-20th century. TOWN PARK at AVALON PARK Avalon Park, Orlando Avalonparkchilicookoff.com Saturday, Jan.27• 8 a.m. / Prices vary A wonderful day filled with award winning chili, music, games, local restaurants and family fun with a FOCUS on raising funds for Florida Hospital For Children - Pediatric Oncology. THE FLORIDA HOTEL & CONFERENCE CENTER 1500 Sand Lake Road, Orlando Mikes-comics.com Sunday, Jan.28• 10 a.m. / Prices vary Guests include artists Tony Moore (The Walking Dead co-creator,Venom), Ryan Stegman (X-23, Superior Spider-Man), Nick Bradshaw (Venomverse, X-Men), Ryan Ottley (Invincible), writer Frank Tieri (Harley Quinn) and artist/writer Kyle Starks (Rick & Morty)! ACTION & ADVENTURE/SCIENCE FICTION Friday, Jan. 26 In the epic finale to the Maze Runner saga,Thomas leads his group of escaped Gladers on their final and most dangerous mission yet.To save their friends, they must break into the legendary Last City, a WCKD-controlled labyrinth that may turn out to be the deadliest maze of all.Anyone who makes it out alive will get answers to the questions the Gladers have been asking since they first arrived in the maze. 101.1 WJRR PRESENTS IN THIS MOMENT WITH P.O.D. ORLANDO MUSEUM OF ART	2416 N. Mills Avenue, Orlando Omart.org Thursday, Feb.1• 6-9 p.m. / Prices vary Windows are the visual bridge between the inside and outside. Doors are symbolic of new opportunities.This show will allow artists to create what is meaningful to them, whether it’s repurposing a piece or incorporating the theme into their works. Media such as painting, photography, and sculpture are accepted, and need to incorporate window and/or door symbolism. ADVENTURES IN FLORIDA Adventuresinflorida.com Wednesday, Jan.31• 6 p.m. / Prices vary Every so often 2 full moons occur during the same month. The second full moon is named a “Blue Moon”. In 2018 there will be Blue Moons in both January and March and no full moon in the month of February. If this kind of cosmic event gets you excited join us for a three hour paddle to watch the sun set and the Blue Moon rise! We will break for an hour on Sunset Island for Tapas and drinks. MYSTERY & SUSPENSE/SCIENCE FICTION Friday, Feb. 2 Inspired by true events. On an isolated stretch of land 50 miles outside of San Francisco sits the most haunted house in the world. Built by Sarah Winchester, (Academy Award (R)-winner Helen Mirren) heiress to the Winchester fortune, it is a house that knows no end. DOWNTOWN INFORMATION CENTER 201 Orange Ave., Orlando Downtownorlando.com Friday, Feb.2• 9:30 a.m. / Prices vary The Downtown Historic Tour gives guests the opportunity to experience Orlando history first hand.The walking tour begins at the Downtown Orlando Information Center and ends at the Orange County Regional History Center. Leading the tour is our local Historic Preservation Officer, Richard Forbes. Join the Historic Walking Tour to see an assortment of buildings that have survived the test of time and adapted to modern uses. That’s right! The same breweries that came together to bring you the Central Florida Ale Trail are now working together to bring you the best beer festival to kick off 2018! This won’t be your average fest as each brewery has been asked to bring some of their best and rarest offerings or to brew up something special just for the event, you won’t see any core beers at this fest! MYSTERY & SUSPENSE/SCIENCE FICTION Friday, Feb. 2 A group of scientific researchers on a space station attempt to harness a new energy source called the “God Particle,” only to unleash something terrifying. CFE ARENA 12777 Gemini Blvd. N., Orlando Cfearena.com Tuesday, Feb.6• 10 a.m.-3 p.m. / Prices vary The Career Expo gives students and alumni the chance to meet with employers face-to-face to discuss career opportunities.This fair is perfect for those seeking full and part time professional positions, internships, volunteer positions and more! UNIVERSAL STUDIOS ORLANDO 6000 Universal Blvd, Orlando Universalorlando.com Saturday, Feb.3-Apr. 7• Times / Prices vary Experience an authentic New Orleans celebration filled with dazzling entertainment at Universal Studios Florida™. Enjoy parades each night with outrageous street performers, colorful costumes and countless beads flying through the air. Hear tunes from authentic New Orleans bands and chow down on mouthwatering Cajun food available for purchase. Plus, on select nights you can catch some of the biggest names in music live in concert. It’s unforgettable springtime fun for everyone. HOTTEST BARTENDER IN CENTRAL FLORIDA! FEBRUARY 2018 COVER MODEL! and a chance to Find Their Beach! many handsome, brilliant Burns boys who will follow, until the Earth is demolished by a Vogon fleet, did I believe this day would come. 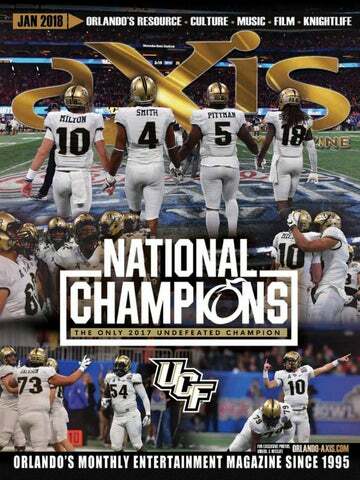 The UCF Knights are the college football National Champions. This is not a self-proclaimed title. This is mother-f*cking fact. By finishing as the No. 1 team in the NCAA-recognized Colley Matrix, UCF has a claim to the National Championship, whether Nick Saban likes it or not. And Alabama’s coach already offered a smug faux-approval of UCF’s claim — “Doesn’t mean anything to anybody but them” — but do we really expect anything more from the NFL failure who eventually became the most powerful man in the heinously corrupt college football corporation? Hell, I’m shocked he knows who or what UCF is. Following his lead, there have expectedly been many, many championship truthers and trolls who would try to steal this from us. Legions of angry Alabama fans, still basking in the afterglow of what was undoubtedly one of the worst “national championship” games in college football history (Georgia choked against a true freshman, and the Tide played just well enough to take advantage), have spent more time taking dumps on UCF than they have learning how to pronounce their new quarterback’s name. Mouth-breathing keyboard mashers with the reading comprehension of toddlers refuse to accept that a little directional school full of nobodies in the heart of Mickey Mouse country could ever even take the field against the school considered by many to be the NFL’s biggest farm system. (Don’t bother reminding them what UCF’s all-time record is against Bama.) Beyond them, UCF is also being dragged by the always-pathetic SEC homers (fans, many in Gainesville, who believe conference glory is shared like television revenue), Miami fans who are mad we’re not all talking about how the U is back (most of them went to UCF), and the old guard media elite, like PAWWWWWWWWWL Finebaum, who is paid to bloviate about the SEC’s glory and would literally evaporate into a cloud of bald dust if he had to acknowledge that a non-SEC team is better than his beloved Tide. There are even so-called UCF fans who claim to be embarrassed by how the nation’s best athletic director, Danny White, is overdoing the celebration, despite the FACT that UCF has a legitimate claim to the title. You know all of these people well, because they’re replying to everything you post on Facebook. They use empty rhetoric and baseless trash talk to demean this accomplishment. I’ve even seen people dropping insults on pictures of children at UCF’s Disney parade. They’re your friends, family members, significant others, and total strangers. Simply put: They’re assholes. But this is what comes with being the champs, and what matters is that we know the truth. With four first place votes in the final Top 25 AP Poll, UCF would have still kept the debate going. This is the first season of the CFP Cartel that does not have a unanimous No. 1 team in the AP ranking. But with the Colley Matrix, this isn’t just us stirring the pot. This is history. This is FACT. Still, it won’t silence the critics and trolls, nor will it stop SEC gremlins and orcs from pausing hour two of First Take to comment (in all-caps, likely) on a UCF Football Facebook post about how the Knights should play a tougher schedule, as if that’s something we can control. (Hell, if P5 officials had their way, they’d completely cut the G5 off, and there are G5 leaders who already want to roll over and die and allow that, leaving the corporation to continue hogging all the cash.) In the coming weeks, months, and maybe even years, there will be more and more people telling you and your UCF Knights why this championship is fake news. They will be arrogant and mean, and they will be unwavering. Nothing you can say will change their minds, even if our claim is as real as I4 traffic. So, as I have said since the clock expired at the Peach Bowl, the solution is simple. Do not argue. Do not feed the trolls. Simply tell them the truth and repeat the three sweetest words my ears have ever heard: National champs, baby.